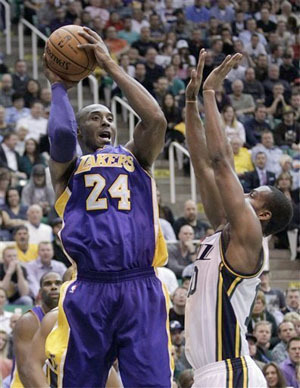 Kobe Bryant looks to shoot against Jazz. The By The Numbers recap for the Lakers 95-86 loss to the Utah Jazz at EnergySolutions Arena in Salt Lake City. The Lakers are now 1-4, and next play home to Golden St. on Friday night. The amount of turnovers the Lakers have committed during the first five games of the season. What’s really sad is they have more turnovers than bench points. Wednesday was the perfect example of this…19 turnovers and 12 bench points. It’s getting to be a scary trend. The percentage of free throws the Jazz made Wednesday. While they only shot 18, they did make 16, including several down the stretch when the Lakers tried to make a game of it…or more correctly, Kobe tried to make a game of it. The number of shots the Lakers missed on Wednesday from the field, for a miserable season-low 33.8% (25-74). Only one player who took more than two shots hit 50% of them…Dwight Howard…going 7-11. One of the more-positive numbers of the night…the number foul shots the Lakers attempted, as they continue to get to the line a lot, courtesy of everyone fouling Dwight Howard. 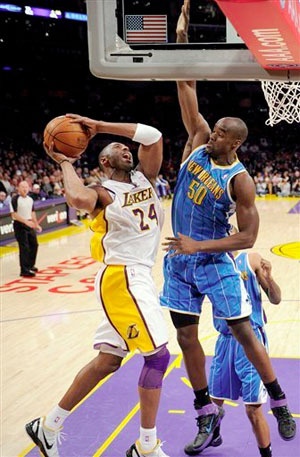 Kobe Bryant hit 15-17 and has made 33-36 (91.7%) to start the season. The negative on Wednesday? They only hit 32 of the 46 attempts. The point differential between the Jazz bench and the Laker bench Wednesday…36-12 was the final tally. 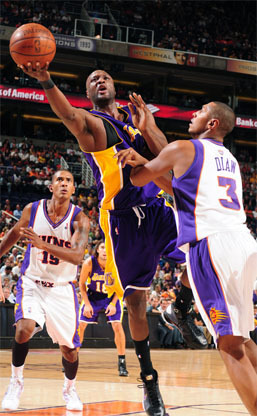 No Laker reserve hit more than one basket, although Jordan Hill did have 12 rebounds. Yay for hustle! The percentage the Lakers shot from the three-point line on Wednesday, going an abysmal 4-23. Before Wednesday, the Lakers actually were shooting a very solid 40.6% from beyond the arc. Steve Blake, Kobe Bryant, and Metta World Peace combined to shoot 4-18 from distance though in Utah. The total team assists for the Lakers. Other than Kobe Bryant, no player had more than two, as the team looked completely out of synch offensively all night, and struggled with any consistent ball movement. The game became “stand around and watch Kobe,” which is a terrible habit the team has always had when they find themselves down. 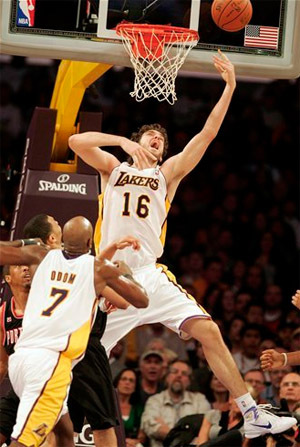 The amount of baskets the entire Lakers’ bench made in Utah. Nothing more needs to be said about that. Oh, keep in mind Randy Foye off the Jazz bench had five three-point baskets himself. Here’s to better luck at home at Staples Center on Friday against Golden St., where the Lakers play their next six games.